More exciting and scenic adventures for you and your players’ pleasure! Customize your sets for your own games! 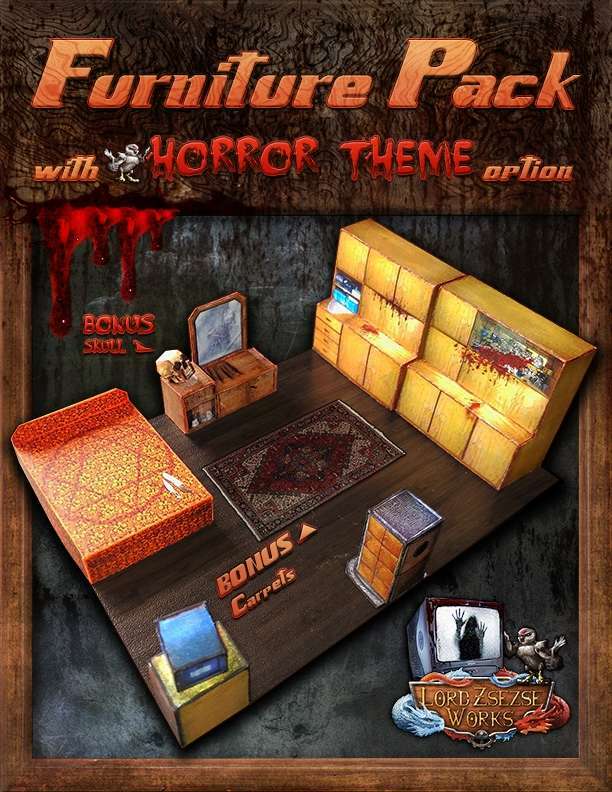 With horror theme option! Turn on the Horror layer in the PDF file. Don’t worry about the room! these parts are small, so you they don’t need much room. We have drawn highly illustrated assembly instructions for every piece to help you build them easier. If you are stuck with assembly you will find some help among the photos and pictures. You can always find inspirational pictures on our Facebook page where you can also write to us. We have designed this set for 28mm miniature games which is perfect for most RPG games and settings that use maps, mats, models and miniatures. You can print models for smaller sizes, too. You will never lose these files! You can download the files from your account after you purchased them anytime. Don’t worry about the missed confirmation emails or accidentally deleted files they will always be here for you. The buttons and layers will work only with Adobe Reader 8.0 or newest. You can download this program from their website for free, even for MAC machines. Please do not use the original built in reader because you will not be able to customize your models with it because the buttons will not work. If you have any question please feel free to contact us here. Thank you! This title was added to our catalog on May 15, 2016.